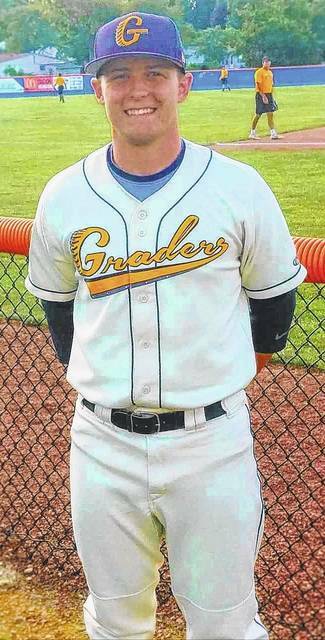 Chad Clinger | Galion Inquirer Galion Graders catcher and occasional designated hitter Matt Noel is the Graders Great of the Week for games played from June 18 through June 25. GALION — The Galion Graders did not have the best of weeks from Sunday June 18 through June 25. Galion went 1-5 in that time from and found themselves outscored 51-33 in that time frame. However, the Graders did get a spark from the offense created by this week’s Graders Great of the Week, Matt Noel. Noel is a six foot, 205-pound junior from Malone College and calls Tallmadge, Ohio his home. Matt is majoring in Exercise Science/Pre-Physical Therapy at Malone and is well decorated as far as awards go on the collegiate level. During that six-game time frame, Noel batted .459 going 11/24 at the dish. Although all of Matt’s hits were singles, he also managed to score two runs and drive in two for the Graders amidst their slump. To keep his momentum going, Noel continued to swing a hot bat on Tuesday when Galion defeated Hamilton, 5-4, in 12 innings. Matt finished the game with a single, a double and a run batted in. Congratulations to Matt on earning the Graders Great of the Week! https://www.galioninquirer.com/wp-content/uploads/sites/38/2017/06/web1_Noel.jpgChad Clinger | Galion Inquirer Galion Graders catcher and occasional designated hitter Matt Noel is the Graders Great of the Week for games played from June 18 through June 25.